We are a prominent name engaged in importing, exporting, manufacturing and trading Forensic Weighing Scales to our esteemed patrons. These products are procured from some of the certified vendors of the market. Moreover, the products offered by us are widely known for their efficient performance, easy operations and low maintenance. In our range, we offer Body Weighing Scale, Organ Weighing Scale and others. 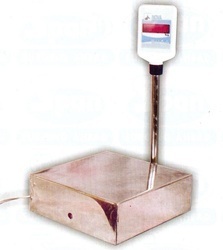 Offered by us is a quality range of Organ Weighing Scale to the customers, as per their exact requirements. The capacity of these scales is upto 15 kgs, thus, these are highly demanded by clients all across the globe. Moreover, these scales are ideal for usage in autopsies, where organs are weighed for record maintenance and forensic investigations. We offer our patrons a range of accurate and efficient weighing scales, which are hygienic and efficient for weighing. coimbatore,Andhra Pradesh, Arunachal Pradesh,Assam,Bihar,Chhattisgarh,Goa,Gujarat, Haryana,Himachal Pradesh,Jammu and Kashmir, Jharkhand, Karnataka, Kerala, Maharashtra, Manipur, Meghalaya, Mizoram,Nagaland,Odisha,Punjab,Rajasthan,Tamil Nadu,Telangana,Tripura,Uttar Pradesh, Uttarakhand,West Bengal,Andaman and Nicobar Islands,Chandigarh,Dadar and Nagar Haveli,Daman and Diu,Delhi,Lakshadweep, and Pondicherry. Looking for Forensic Weighing Scales ?